And I still haven't finished paying my education loan aka PTPTN. HA-HA.. It was actually just yesterday that I told my student I just graduated. Fresh graduate, kononnya... And today. Reality strikes from Instagram. It has been a year! Thanks to the friend who made me realize a year ago on this date, 11th November, we had our graduation at DATC. 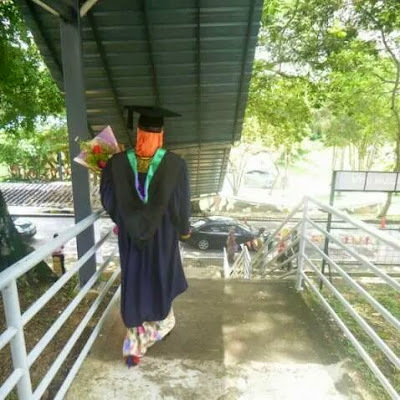 "Dulu I used to boast that I wouldn't be very excited during graduation because I think I've achieved bigger things in life.. Mungkin sebab thesis, mungkin juga sebab peluh keringat mengangkat besi dan berlari-lari di padang. Entah.. Maybe after all the hardship.. Menitis juga air mataku di hari konvo. Sebak. Alhamdulillah.."
Well these are the words I copied from my Facebook on the day I graduated. Because the feelings I have now might not be the same back then. I never really wrote in detail how I feel back then. OKAY. I might remember a few things. I remembered tears trickling down from the corner of my eyes as I saw my lecturers walking up the stage during the opening ceremony. I remembered how touched I felt singing "wujudmu disini ditanah anak merdeka..." I remembered looking at Dr. Anuar up on the stage from my seat and feeling so thankfull, while memories of being in his class appearing disappearing appearing disappearing in my mind.. And I remembered how thankfull I felt at that moment for being able to graduate on time. So, a year after graduation what have I achieved? Well I worked at a private school for 6 months before I made a crazy decision to quit and do business. Crazy because the salary is high. They said fresh graduates can demand about 2.5k. Oh, I received more than that. It was because of my experience. Fresh graduate but I got a lot of experience. 3 years of no weekends aka no life seemed so valuable when I got the salary I demanded. Not at the moment... I've been thinking a lot these days. I wanted to do something that can benefit the society. Yes, I can conduct a research and present new knowledge with my Masters. But even the current knowledge/ technology are still not practiced... I applied for TPM (Tenaga Pengajar Muda), though. Thinking of furthering studies for free (sort of). But then, the contract got me thinking many times... I never wanted to be a lecturer... Yes I love teaching but somehow the structured working hours turned me off. Oh yeah, maybe I should write about my graduation. While I still remember the moment. Heh.